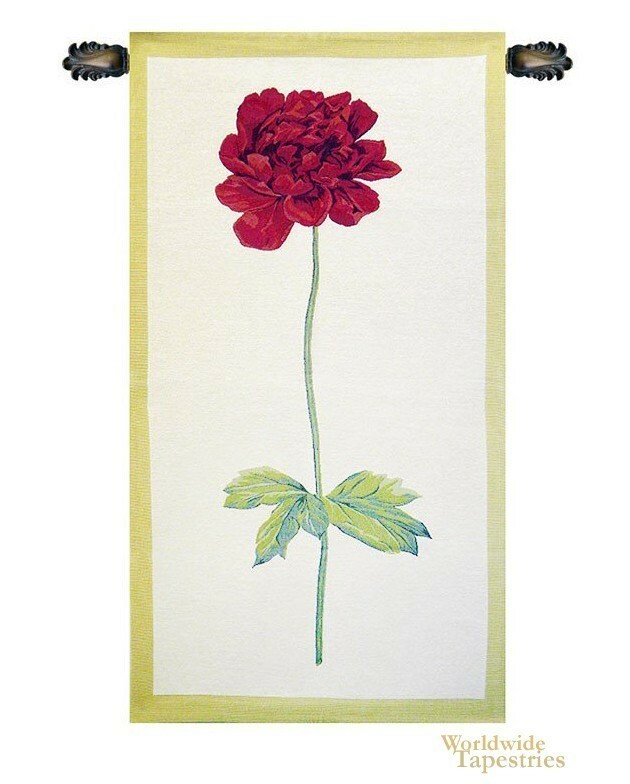 This tapestry 'Redoute Peony' shows a peony in bloom, based on a work by French artist Pierre-Joseph Redoute. The peony is a flower that has many traditional as well as romantic associations. The word peony was named after the Greek god of healing. It is believed that a picture of peonies placed in the south west corner of a home will bring romantic luck to the ladies of that home. Here we see the crimson leaves of the flower and the pointed leaves near the base of the cutting. Redoute, being an artist of plants as well as a botanist, contributed over 2100 published prints of plants of over 1800 species, some of which were illustrated and rendered for the first time. This tapestry 'Redoute Peony' is backed with lining and tunnel for easy hanging. Note: tapestry rod and tassels, where pictured, are purchased separately. Dimensions: W 28" x H 50"